This entry was posted on Wednesday, August 24th, 2011 at 15:45 and is filed under Election 2012, GOP Candidates, Politics. How Dare You Ask Me That? I’ve told you before what I think of Rick Perry. As a Texan, I really don’t think all that much of him, and as a governor, the only thing that has stopped him from making a complete mess is a legislature that is more conservative than he. His pandering to La Raza and ACORN along with his tendency to govern as a statist has always caused me heartburn. Combine that with his crony-capitalist ways, and no, I don’t think he should be allowed anywhere near the White House unless he’s on a tour as a member of the public. In this instance, a student at the University of Iowa, Drew Hjelm, tries to ask him a question about the debt problem in Texas, and Perry cuts the guy off, lies, and says the kid doesn’t know what he’s talking about. Nonsense! The young man had it right. I also wonder about the bullying implied by poking his finger on the young man’s chest. I don’t know what they do about such behavior out in Paint Creek, but that’s a sure-fire way to start a fight in many parts of Texas. One wouldn’t want to try that for fear that you might well pull back a stump. What’s next? Is he going to pull off his boot and pound it on the lectern? This sort of tactic simply isn’t acceptable in a modern campaign. Pointing would have been sufficient, but this reaction was more than Perry should have permitted himself, especially since he was trying to evade answering the young man’s question. 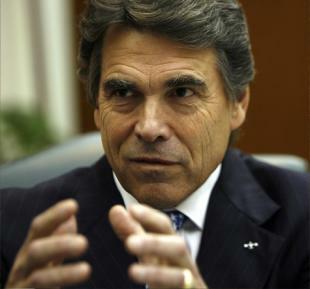 Under pressure, in front of the cameras, Perry reverted to bullying and obfuscation. Nobody needs a President like that. Check out this excellent article for full coverage on this incident during which Rick Perry was trying to dodge the student’s question at Conservatives4Palin.